There is no clear scientific evidence that increased outdoor lighting deters crimes. It may make us feel safer, but has not been shown to make us safer. 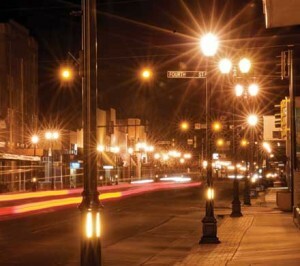 The truth is bad outdoor lighting can decrease safety by making victims and property easier to see. A Chicago Alley Lighting Project showed a correlation between brightly lit alleyways and increased crime. Glare from bright, unshielded lights actually decreases safety. Photo by Jim Richardson. In fact, most property crime occurs in the light of the day. And some crimes like vandalism and graffiti actually thrive on night lighting. A dark sky does not necessarily mean a dark ground. Smart lighting that directs light where it is needed creates a balance between safety and starlight. Outdoor lighting is intended to enhance safety and security at night, but too much lighting can actually have the opposite effect. Visibility should always be the goal. Glare from bright, unshielded lights actually decreases safety because it shines into our eyes and constricts our pupils. This can not only be blinding, it also makes it more difficult for our eyes to adjust to low-light conditions.